Since new drivers are all required to pass a skills test before becoming licensed, we must be sure to prepare students for all phases of the test. Parallel parking is a particularly challenging part of the road test, as it requires students to perform the parking and backing exercises in the off-road portion of the road test and are disqualified immediately if they do not meet the requirements. Official Driving School students are rarely unable to pass the road test, but the few that are challenged usually relate to the inability to parallel park. To ensure that this exercise is as thorough as possible, Official Driving School provides students with multiple practice attempts. Learning the basic principles and reference points required to parallel park successfully prepares most students to pass this portion of their test. Initially, try to find a quiet area so you don’t block traffic and you have time to stop the car and explain each reference point. Also, be sure to use a method that allows the student to turn the tires while the car is in motion. If the tires are repeatedly and sharply turned while stopped, this will cause unnecessary wear on your power steering unit and as well as the tires themselves. A general rule-of-thumb is to back slowly and to turn the wheel quickly. Another good general rule is to keep the student looking back while backing and looking forward while moving ahead. Students, of course, fear knocking over the parking cones at the exam stations, so explain that this usually happens when the car is moving in one direction while the driver is looking in the opposite direction! Stop your vehicle even with the car parked in front of the opening (steering wheel to properly steering wheel), approximately 2 to 3 feet from the parked vehicle. When clear, back slowly while turning the steering wheel quickly all the way right, and continue back until the upright portion of your front seat on the passenger side is in line with the rear bumper of the vehicle you are parking behind (using the curb and the front bumper of the car parked behind as a 90 degree angle you would be at about 45 degrees). 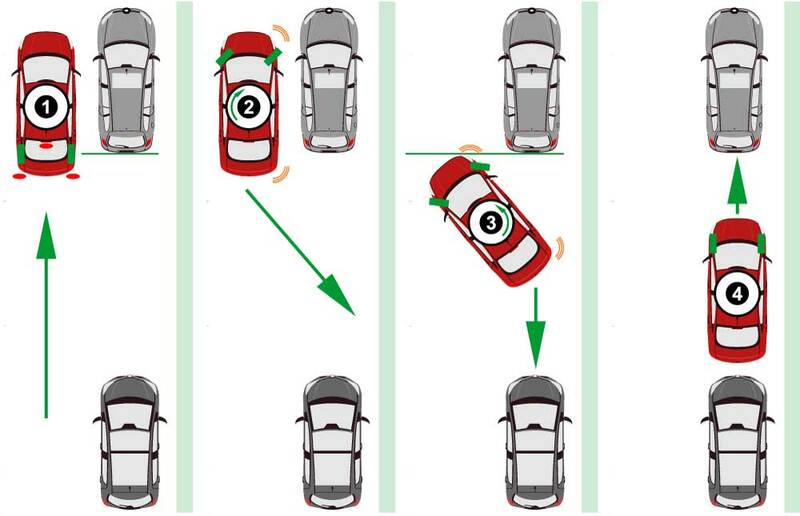 Continue back slowly as you quickly turn the wheel back to center (a glance forward is allowed for a reference check), and keep backing until your front bumper is in line with the rear bumper of the vehicle you are parking behind. Continue back slowly as as you turn the wheels sharply left. As your vehicle nears the car behind and your front end swings in line with the curb, stop and shift into drive.